Facebook is, by far, the largest social networking site out there. With millions of daily visitors, it’s also one of the most popular websites, period. Because of the massive traffic that Facebook receives, it is important for business owners to promote their business on Facebook. Thankfully, it’s become pretty easy to build professional Facebook business pages, with the help of premade templates. 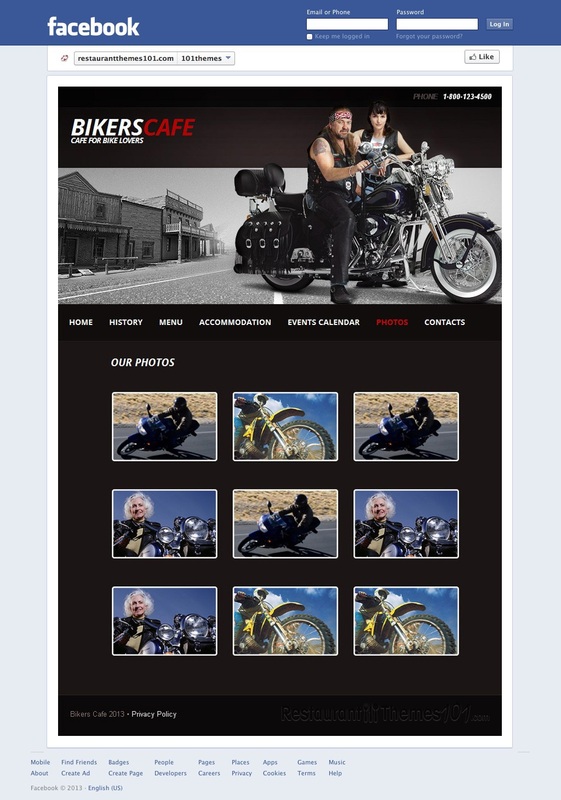 Bikers Café is a Facebook café page template, designed and developed by Cowboy, and available via the Template Monster marketplace. 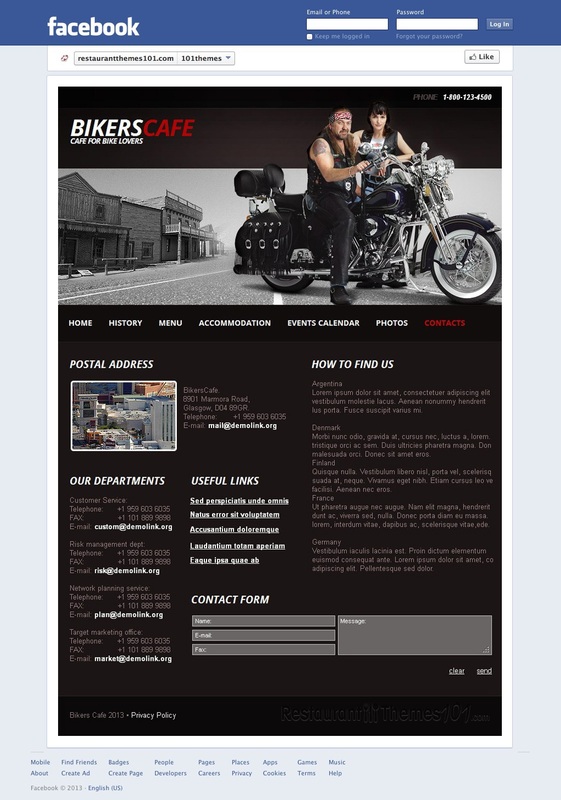 As the name suggests, this template is geared towards bikers. 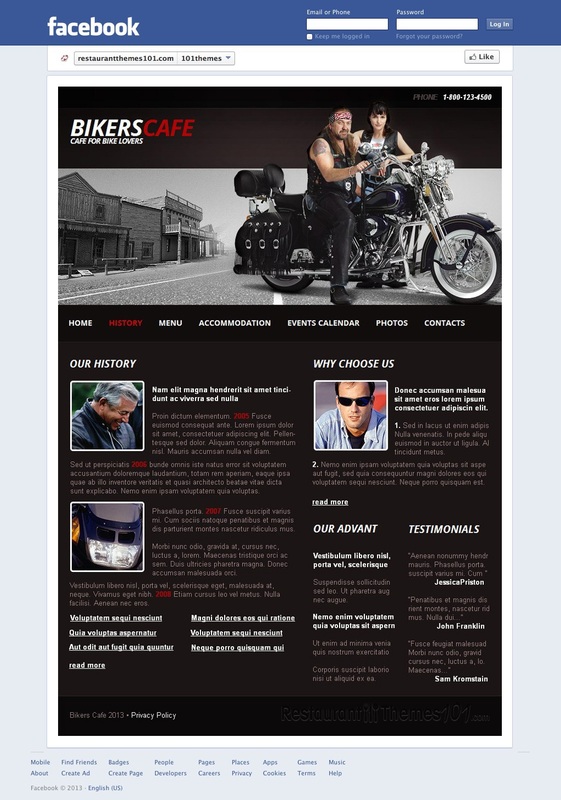 The theme uses dark colors and a simple layout to accomplish their goal of appearing to motorcycle enthusiasts. 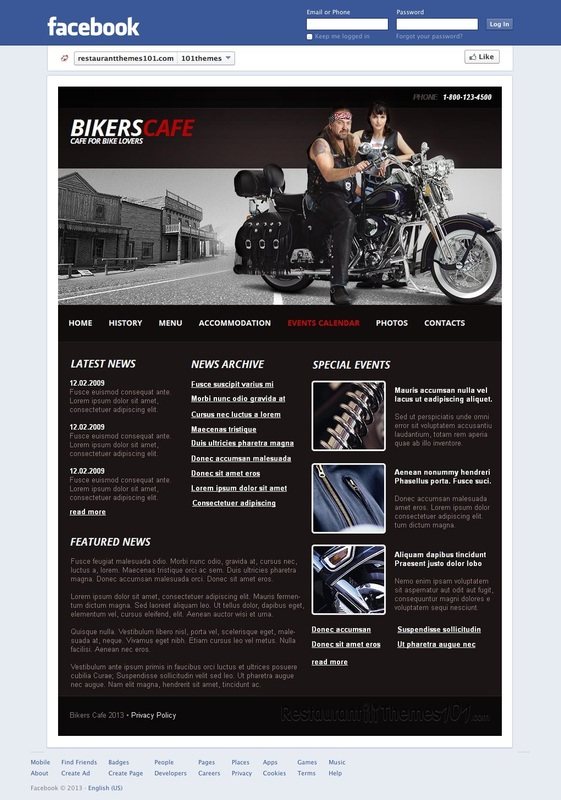 Although this Facebook café page template is aimed towards bikers, it could easily be adapted to target a variety of other audiences. 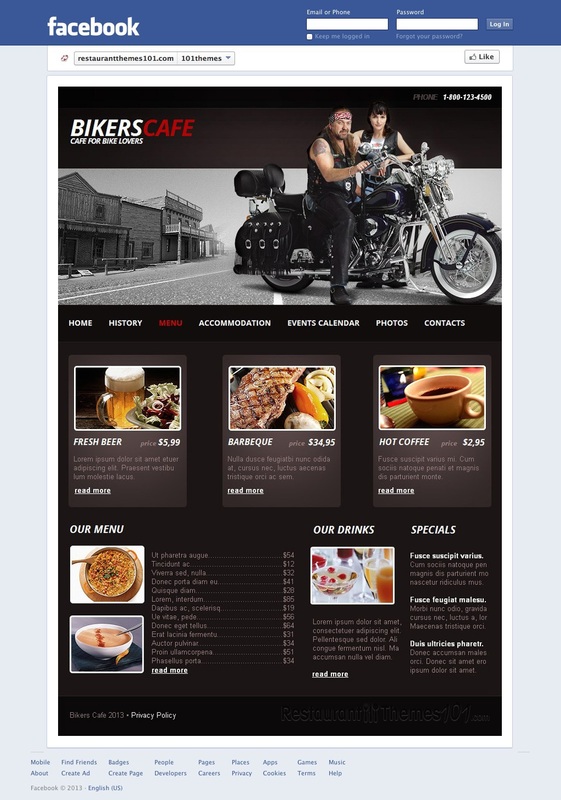 The layout of Bikers Café is extremely simple. It consists of a large static header, where you can upload and host any image you want. Below that is a simple text-based menu, where you can place links to the various pages, including your contact page, about us page, menu, events, etc. Under the menu is an area where you can place up to 3 different thumbnail images and descriptions that link to pages on your website. The bottom of the page is reserved for hours, phone number, location, and a description of your establishment. 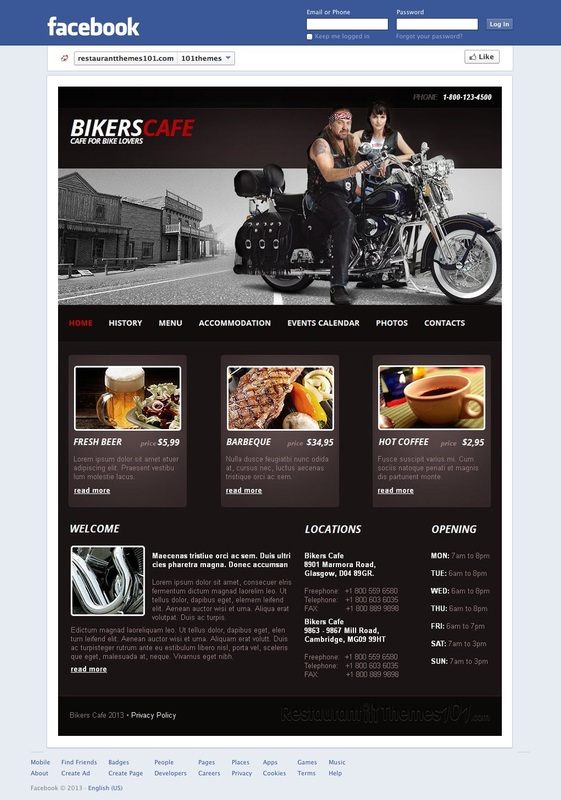 This Facebook café page template is powered by the ever-popular Moto CMS that Template Monster is known for using. Moto CMS is a powerful, feature-rich content management system that allows you to add and edit content to your Facebook page from a simple control panel. No coding or web development experience is necessary, which means even a computer novice could build a professional Facebook page! Moto CMS also allows you to continuously add to and edit the content of your page, allowing you to keep everything under control and experiment with new techniques.